The enormous fire in Borneo last year were in the media but the full scale of this catastrophe is only visible when you plot the fires on a mal and make a movie out of it. See for yourself, basically it burnt all over Borneo. For simplicity I left Malaysia out, but there were significantly less fires. The conservation organisation Orang-Utans-in-Not eV in Leipzig and I are using the movie to make people aware on the extensive habitat loss for Orang-Utans in Borneo. Of course the remaining wildlife is also badly harmed by this loss and by the tremendous air pollution. Very often the burnt area is converted to palm oil plantations, that hold essentially no biodiversity at all. Feel free to share and link! The species list of Germany and Iran have been updated and expanded. Does anybody know a comic book with an earwig as the main character? If so please send me a note or a link, I think, these little crawlers would make excellent characters and offer so much in their biology for an entertaining comic book. Mail to me. 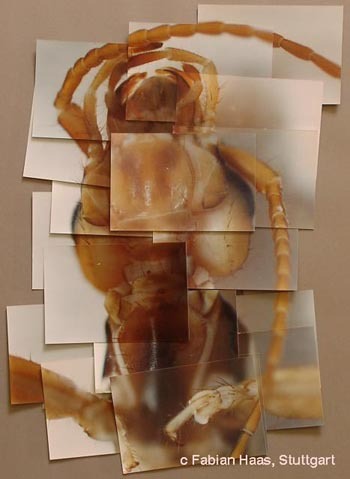 A nice contribution by a friendly blog on the subject of Earwigs and Wine. In short: they don't mix. and Nikon F70. Negative film & prints. 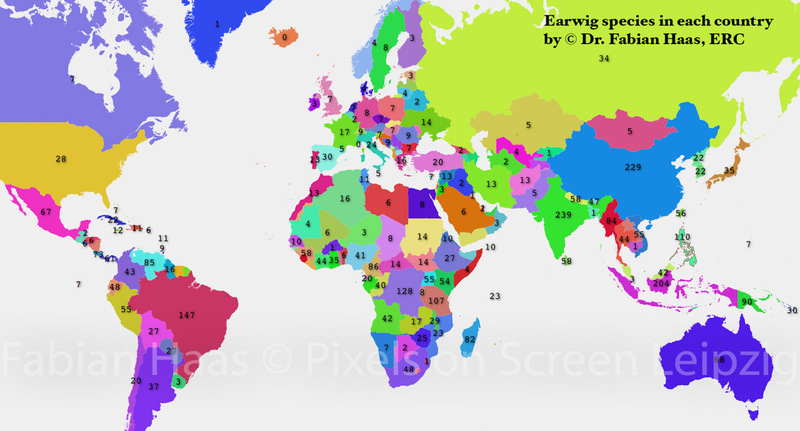 The number of Earwig species in all countries. Produced by Dr. Fabian Haas and shown here for the first time. © Copyright 2004-2018, Web site designed and authored by Fabian Haas 25.05.2018, Leipzig. Legal Notice and Disclaimer and Impressum. Die Datenschutzerklärung nach DSGVO ist hier nachzulesen.